Campanula portenshlagiana blooming at Stonecrop Gardens near Cold Springs, N.Y.
Who among plant lovers (and if your reading this blog you are undoubtedly one) do not struggle with the unattainable standards fostered by certain spectacular plant photos in garden books and magazines! Like a song melody that constantly pops into your head, a certain plant photo can seem almost tyrannical in its single-minded effort to invade your consciousness. However, while these kinds of photos aim to capture perfection, they leave out all the “sturm und drang” that goes into that perfect plant moment. So even though the above photograph was hardly remarkable as a work of art — a rather typical stone wall covered with blooming Dalmation Bellflower — the image would, from time to time (unexpectedly), pop into my head. 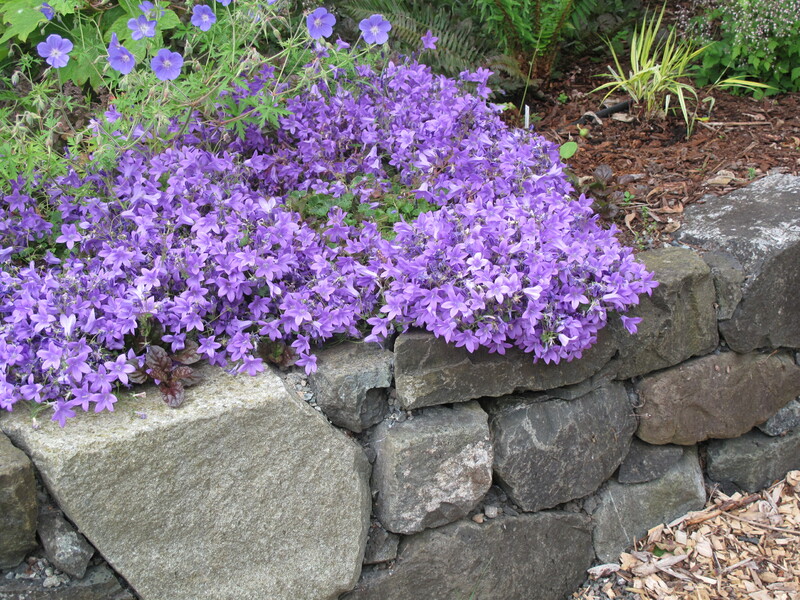 Then, about three years ago I finally ordered four Campanula protenschlagiana plants and established them on my own (albeit quite smaller) stone wall. 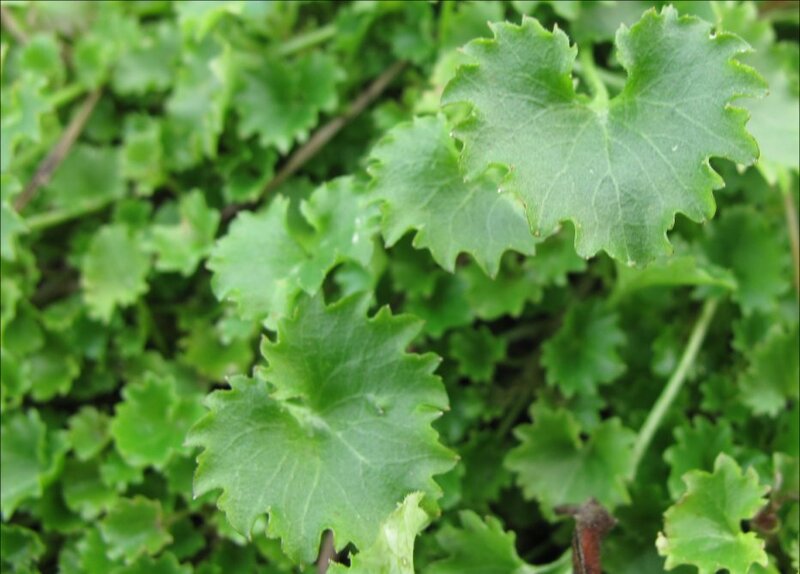 Here they are in their third season, nice clumps of serrated green leaves doing quite nicely after our mostly mild and, of course, wet winter. Soon after, purchasing the 4″ pots of Dalmation Bellflower, I visited Stonecrop Gardens (the source of the photograph) in the Hudson River Valley near Cold Springs, NY. Unfortunately, it was in September of 2011 and blooming was apparently long finished. And, I don’t recall finding that particular stone wall, though the remarkable garden and a fine alpine house were inspiring. So even if tyranny is defined as “an arbitrary or unrestrained exercise of power,” we can’t deny those carefully chosen images don’t inspire us nonetheless. I’m hoping this is the spring and summer that these four clumps finally make it over the edge of the modest rock wall and tumble toward the wood chip path. Stay tuned for a picture later this summer. Who knows, it may just be an image that sticks in your head. Despite reading in a Campanula book first published in England that this species spreads vigorously, my four plants barely made it over the wall — and this is their third year in this spot! Jason at Garden in a City blog calls it a kind of plant “delusion of grandeur,” although he was inspired by an actual visit, rather than a photo. Here’s a link to his post: Delusions of Grandeur? This entry was posted in Plant Picks and tagged Campanula portenshlagiana, Dalmation Bellflower, Stonecrop Gardens by Bart Arenson. Bookmark the permalink. Your plants look plenty healthy and they look happy to me–I smiled when I saw your pictures. I wonder if some were growing in the wall in NY. 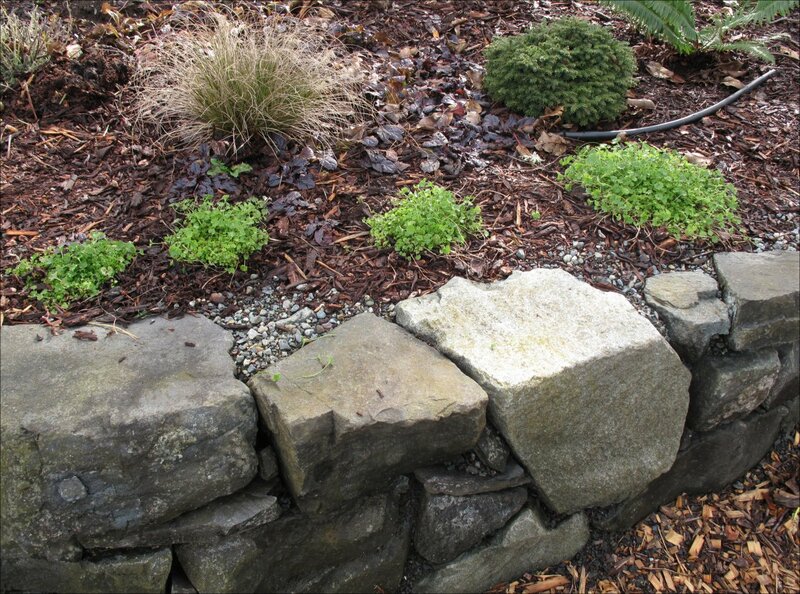 Our area botanical garden–Powell Gardens–has a living wall island with all sorts of things rooted in the wall itself. Your wall is not as talk but maybe you could tuck some cuttings in to get the look you want. What you have looks good to me, though. Thanks Bob. I hadn’t considered that some of the plants at Stonecrop could have been tucked into the wall to give that effect. I do have some sedums tucked in other parts of the wall and they work well. 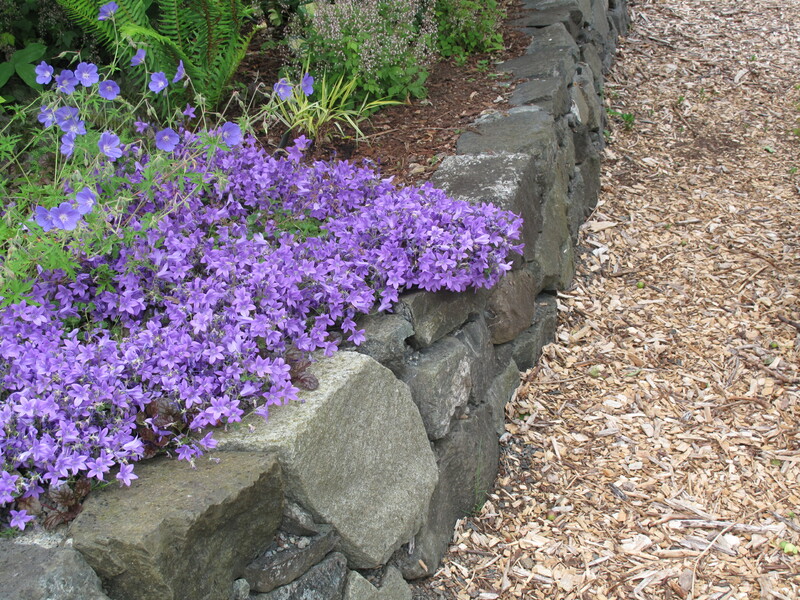 I’m going to give it a try with the Campanula for next year. I tried to find a picture of the Powell Gardens living wall, it sounds really wonderful, but their website only has a description within the Island Garden section: “The retaining wall along the garden’s path is the longest “living” wall in North America. 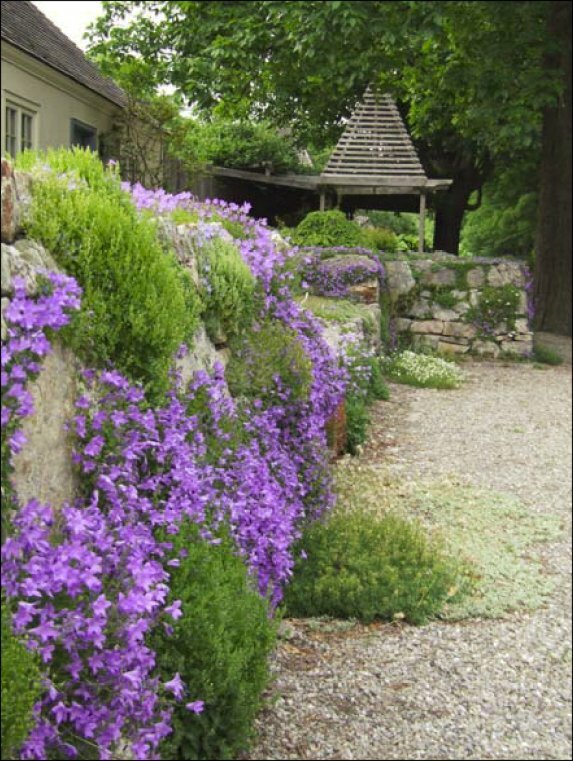 Made of stacked limestone, it’s home to all sorts of rock-loving plants that thrive in a well-drained planting medium….” Boy would I love to see that wall! I’m a big fan of rock garden and alpine plants. But the ones that like a high PH, and are limestone lovers don’t do so well here in the Pacific NW where we have acidic conditions. Fortunately there are many alpines that do well in a neutral or acidic PH. I don’t know the blog where I found this picture but it does show how the wall is planted. It curves around the center of the island so it is hard to get a full photo.